‘Center for Arizona Poopy Ideas’"
Cathi Herrod's Center for Arizona Policy hates gays, abortions, and likes to tell politicians what to do. In the recent past, Arizona has become the “Comedy Central state” due, in part, to SB-1070 and SB-1062. A running joke in Phoenix concerns Arizona’s “31st senator” Cathi Herrod, head of the conservative and anti-LGBT Center for Arizona Policy, author of SB-1062. While many believe that SB-1062 is dead after Gov. Jan Brewer’s veto, the fun-loving folks in this group have not given up. The Center for Arizona Policy (along with almost everyone else, including Stonewall Democrats of Arizona) sent out candidate surveys earlier this year as a run-up to endorsements. Candidates being surveyed were to mark either the support or oppose circle. The wording is almost exactly that of the late SB-1062. Another thing many are not aware of is that Herrod is a paid adviser to Doug Ducey, GOP candidate for governor. Ducey recently praised the U.S. Supreme Court's decision in the Hobby Lobby case, calling it a "win for religious freedom" even though he said just a few months ago that he would, as Governor, veto an Arizona measure with the same underlying principles. With Arizona being home to groups such as the Goldwater Institute, Arizona Center for Policy, Arizona Family Project and many others, with almost all of the current Republican House and Senate members being members of these groups, Stonewall decided it was time to make a move. 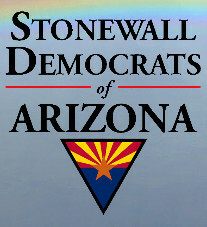 After several meetings among our leadership and consultations with Democrats both in office and running for office, Stonewall Democrats of Arizona submitted its paperwork to the Arizona Secretary of State to become a lobbying organization. On July 30, Stonewall was approved as a "principal" organization, legally allowed to lobby the legislature. On the same date, I (as Stonewall's chair) was approved as the designated lobbyist. No more will Herrod and groups such as hers lobby for discrimination unopposed in Arizona.